Windows: Replacing caulk around windows will provide a tighter seal to cut down on the amount of air escaping. Doors: Replace weather-stripping around doors. Eliminate gaps where the air can leak out. Attic: Frequently check your air ducts in your attic for holes or tears in the ductwork. Also inspect the insulation in your attic, make sure that bare areas are covered sufficiently. You may even consider replacing to a higher material level of insulation. Install ridge vents on your roof to release excessive heat from the attic that will infiltrate through ceilings. Fireplace: Dampers can be closed in fireplaces when not in use. Check with an authorized fireplace company to inspect your fireplace and chimney for openings where your air could be escaping. Water Heater: Set the water heater temperature at a lower setting. Install a water heater blanket to prevent heat loss. Appliances: When using your washing machine and dryer for your clothes, always try to make the cycle a full load and use cold water as much as possible. Also have a full load when using your dishwasher. Unplug stereo equipment, cell phone chargers, and other small equipment using power strips. Any item with an LED screen is a potential energy drain. Did you know that you can cut cooling costs up to six percent for every degree you raise your thermostat in the summer? 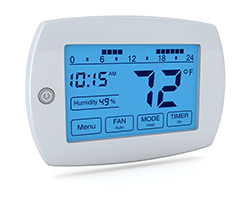 Install a programmable thermostat that will automatically turn your air off or up during the times of the day when you are not at home. Install blinds or draperies to help the hot sun from heating up the room in the summer. Solar screens would also be a good idea. Change or clean your filters every 3 months. Have preventative maintenance done every 6 months. Make sure it includes cleaning both indoor and outdoor coils. Freedom A/C offers top notch service every time we call, we wouldn’t even think of calling another company!